A website is never DONE. Until your business is DONE, your website should never be done. Your website is (or should be) an excellent employee who represents and works for you every day. Like any employee, your website should be an asset, not an expense. In this article, learn why it’s important to care for your website as you would a valuable employee. Your Website Has a Job To Do. Take Care Of It Well. Business owners rely on word-of-mouth, advertising, lettering on their vehicle(s), signage, coupons, Facebook, Instagram (and the list goes on) to create awareness and attract new customers. In the 21st Century, before most of us make a decision to visit a store, a restaurant, or call a service company of any kind, we visit the company website to learn more. For emphasis: MOST PEOPLE VISIT A COMPANY WEBSITE BEFORE THEY MAKE A DECISION TO BUY. Your website has a BIG JOB to do indeed. It’s called Customer Acquisition. Your website can compel visitors to buy or take some sort of action (such as call you, email you, fill out a form, print a menu, request a quote, make an appointment) or it can repel visitors. Your website’s #1 job is to acquire customers, and this is a very good reason to update your website regularly. Action Step #2 Create a CTA: Call To Action. Offer a discount coupon or a Buyer’s Guide, or some other piece of value which the visitor must request on your website. Any of these is a value-add and brings your relationship with the customer a bit closer to you. The #2 thing your website should do is answer the questions to which people are looking to have answered. No matter what your business, people are looking for answers to a question or problem they’re trying to solve. Give them everything you can possibly give them in words and, if possible, with pictures. Your website is often the first communication you make with a potential customer. You can make it pleasant and easy (like a pretty, friendly, smiling hostess in a classy restaurant), distasteful like a salesman in a used car lot, or like a Flea Market on a gravel parking lot. I’m not saying you need the most beautiful website in your industry, I’m saying it should be clean, easy to read, organized, and useful. The following action steps serve your customers well, and they also serve you at the same time. Action Step #1: Create a Frequently-Asked Questions page on your website. Pose the questions people ask you and then answer them. Have you noticed that sometimes customers don’t ask the right questions? You can include the questions people SHOULD ask in the FAQ section. These can be very helpful to people and also help to steer people in the right direction like no other information can. Action Step #2: Add a page for every category of items or services you sell. After you get that done, start making a page for every individual service or item you sell. Include pictures. This is a great investment. 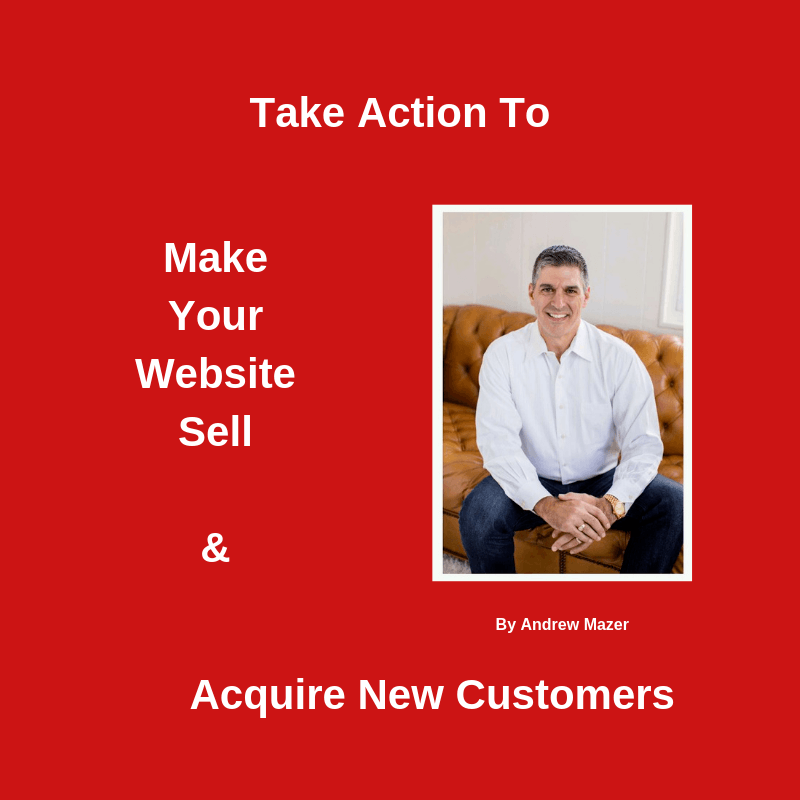 It makes your website a selling machine now and it keeps working for you forever. It also makes your website super-friendly to the search engines because they know ALL ABOUT everything you sell and your website will rise to the top of the search results. These website improvements serve both you and your customer. I can’t over-emphasize this strategy. Action Step #3: Make your website easy to read and east to navigate. Black background with white text is difficult to read. Black background with ANY OTHER color is even worse. Go with dark text on a white background for the best readability. Make sure you look at your own website on mobile devices and desktop computers to make sure it’s easy to read and navigate. More than half of local business searches are done on a mobile device. ****The advice in Action Step #2 will also improve your chances of being included on Voice Search. I’m talking about being among the search results when people are searching for answers by asking Siri (on iphone), Alexa, and Google Assistant. This work will involve time, effort, and probably expense. But it’s really NOT an expense-it’s an investment because it will convert more website visitors into customers. Just as adding an addition to your building or your home increases its value, building a powerful website and customer base adds value to your business. In my opinion, adding value to your business makes all other investments pale in comparison. Your customers are your greatest asset and your website is your customer acquisition machine. Action Step: All the work done on your website, all the images you add, the details of the products or services, and even the frequently-asked questions can be used in other areas of your marketing. repurposed on your social media accounts and printed material. We call it repurposing. Repurposing your content is cheap and easy and it’s also effective in amplifying your message and your business. These activities take time and planning. They’re especially effective when done by a marketing expert with knowledge on how to optimize the content to be friendly to the search engines. Search Engine Optimization is how you get the search engines to show YOUR website when people are looking for a business, a product, or a service like yours, even if they don’t already know you exist. One more important thing to add here. In the title of this post, the last word is REGULARLY. Updating your website never ends. Need help? That’s what we’re here for. Call 1-866-799-2825 if you’re interested in talking about improving your website so it can become the customer acquisition machine it can and should be.